The day before yesterday was an overcast, damp day. There as even a thin crusty coating of ice on the grass. Yesterday, well, there was snow. Yes, it's the perfect weather for soup. In winter I am especially drawn to making hearty stews and soups. I just find them so comforting and soul-warming. Plus, a warm soup bowl is especially easy to cradle and savor whilst sitting in front of a roaring fire. This recipe is a variation on a Tuscan bean soup, and, as always, was based on what I had in the house. The secret key ingredient is the cheese rind. By using the rind, the cheese flavor infuses into the soup, providing subtle savory background notes. Normally I'd say use Parmesan, but I had the heel from a chunk of aged Asiago and it worked just fine. After shoveling the walkways this soup made for a nice reward. 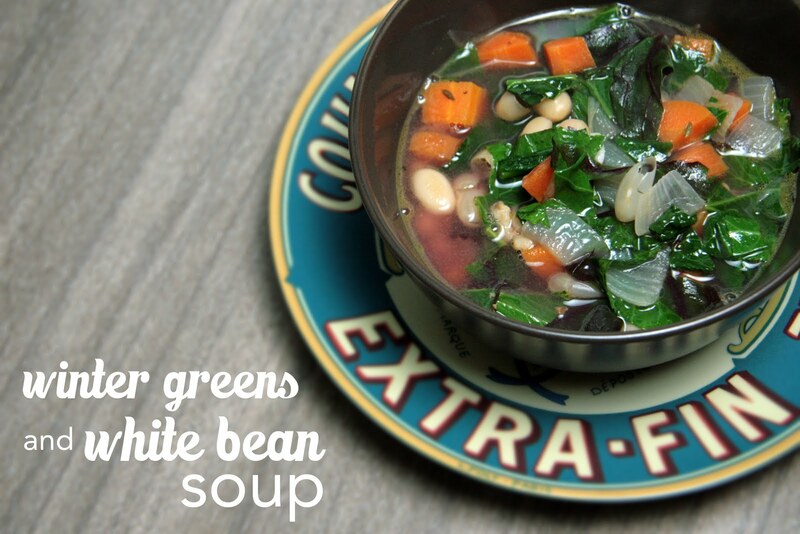 Here's to getting through winter chores one bowl of soup at a time. Cut off any tough ends of the greens and rinse thoroughly. Pat dry and shred. Set aside. Over medium high heat in a large soup pot heat the tablespoon of olive oil. Then toss in the bacon pieces and saute until crisp. Add the carrot, onion and garlic. Saute until the onion becomes translucent. Pour in the broth and add the beans, bay leaf, thyme and cheese rind. Bring it all up to a boil. Reduce the heat to low, cover, and let the soup simmer for about 20-25 minutes. Uncover the pot and add shredded winter greens. Stir and continue cooking 3-5 minutes until the greens are wilted. Before serving be sure to remove the bay leaf and the cheese rind. And, if you like, sprinkle a little crushed red pepper flakes over the top. So, what are your favorite winter soups? 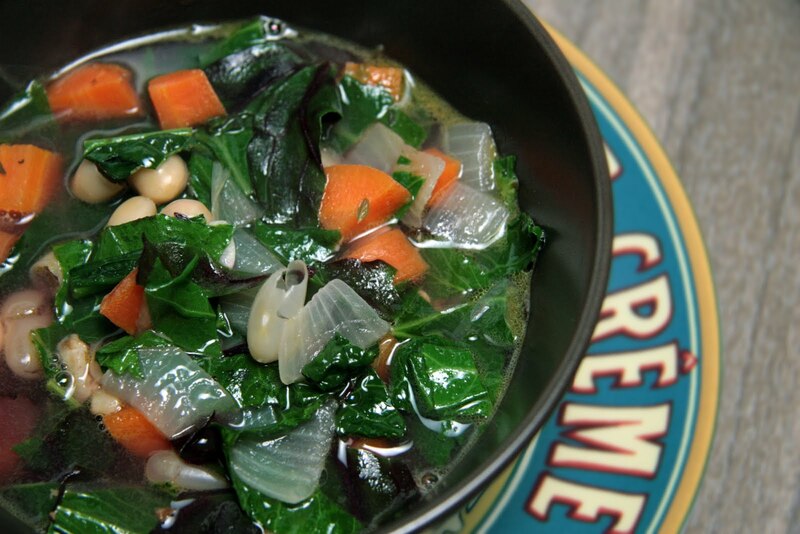 This soup will be wonderful to make with these cold winter days we're having! Thanks for the recipe. I will have to leave out the beans to make it Paleo though. But awesome just the same! Thanks Brenda. Without the beans I'm sure it'll taste just as delicious.